Another thing I learned during my absence? The Jersey Shore is awesome. No, no…not the TV show. (Although I’m not ashamed to admit that I have spent many a night thinking that too, was awesome). I’m talking about the actual Jersey shore. You see, my better half and I decided to take a little road trip out to the Jersey Shore over the weekend, and we landed in a lovely little ocean town called Bradley Beach. We collected seashells, played in the sand, and had the most amazing corned beef hash, French toast, and crab omelets at a local breakfast spot called The Buttered Biscuit. If you live within driving distance, this place has the best cinnamon butter I’ve ever tasted! Yum. Also…did I mention that this trip was my first time at the ocean? Like, ever? I know it sounds crazy considering the majority of the world is comprised of water, but the opportunity just never presented itself. Ohio is far enough away from the ocean that it takes a reasonable amount of effort to get there…effort that I just never had until this weekend. 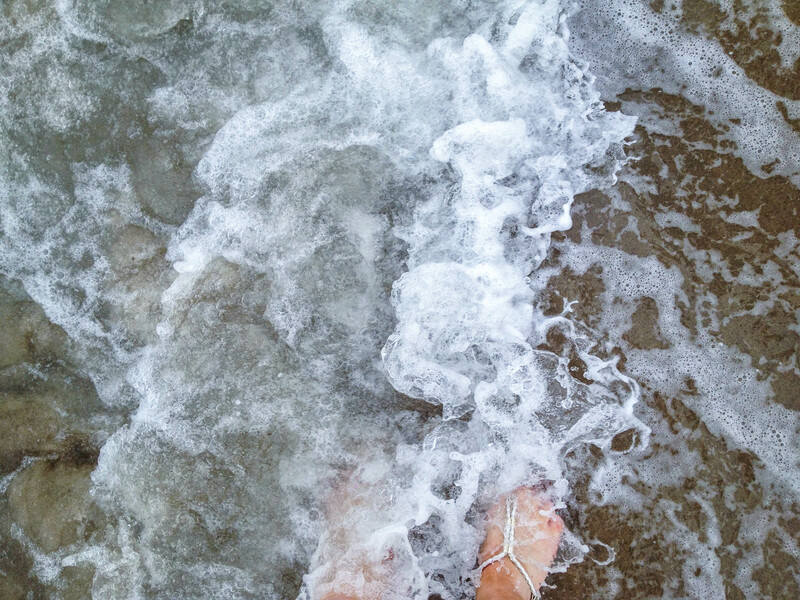 My feet, in the ocean, for the very first time! Also, in Ohio we are lucky enough to have Lake Erie, one of the infamous Great Lakes, in extremely close proximity. I had always thought this was an acceptable substitute for the ocean…until now. Don’t get me wrong, I love me some freshwater beaches – but there is just something so invigorating about ocean air and waves crashing against the shore that makes the experience seem a little more…well, special (but maybe that’s because I didn’t grow up with it). On our way to the Garden State, we made a stop at my future in-laws’ house in Pennsylvania to celebrate my mom’s birthday. As my gift to her, I brought along my trusty Cuisinart ICE-30BC and offered to make any flavor of her choosing. Much to my excitement, mom-in-law chose cookie dough as her birthday treat. And, better yet, she already had some store-bought cookie dough in the fridge, so it would eliminate unnecessary time spent preparing the homemade stuff. Perfect, I thought. Well, turns out, not so perfect. My low maintenance birthday treat of cookie dough ice cream resulted in anger, bitterness, and a household divided. Okay, so I’m being a little dramatic. It did, however, raise a heated debate amongst my family members. Not about the ice cream itself; but rather, the consumption of raw cookie dough and the prospect of food borne illness. Naturally, my ballsy mom-in-law scoffed at his concerns. As the tension in the room grew more palpable, a debate ensued. 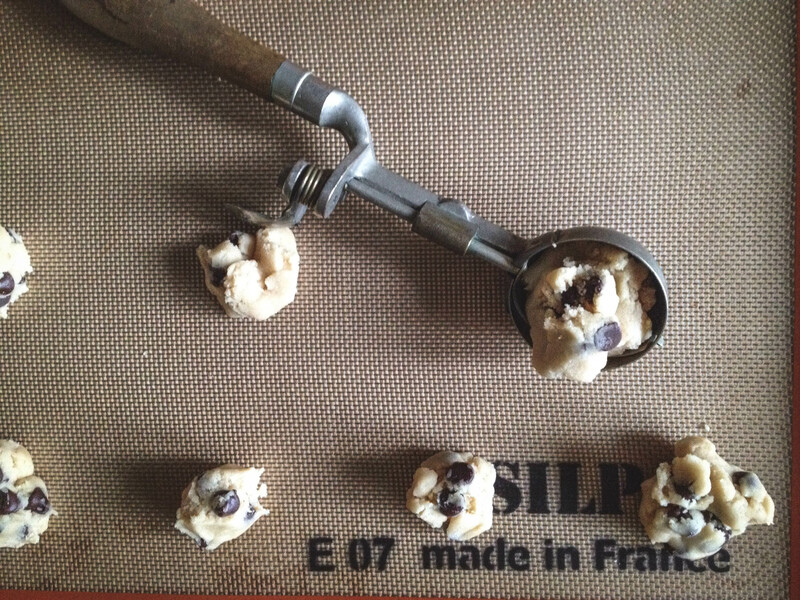 While one side argued the daunting risks of raw cookie dough consumption, the other was ready to throw caution to the wind and dig into the soft and salty treat. 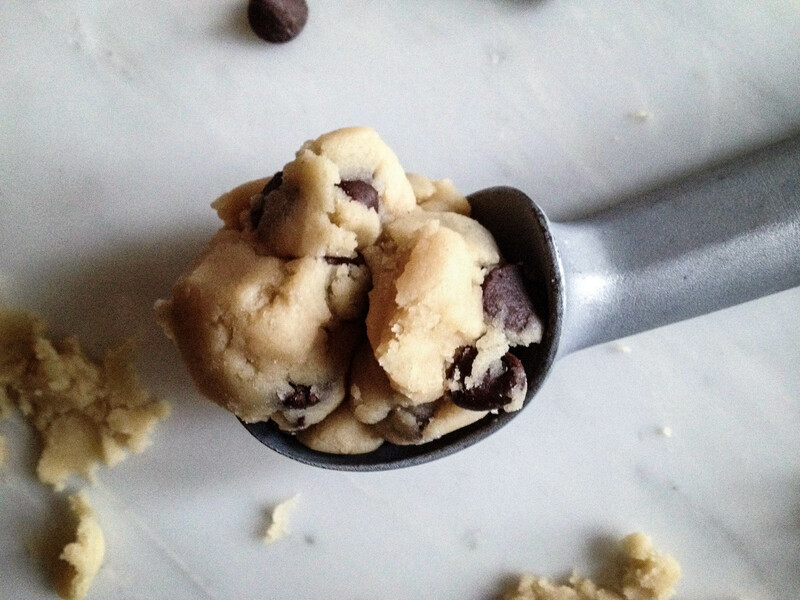 Sure, as children we all snuck bites (or entire bowls, but who’s counting) of cookie dough, despite the fair warnings of our parents or other responsible adults. But for some reason, even in adulthood, it’s hard to kick the habit (even though we all know better). This thought process seems even more ridiculous when you consider that most sane people avoid raw chicken, but will readily consume endless amounts of cookie dough without giving it a second thought. Although our little debate in Pennsylvania resulted in half of the household eating plain vanilla while the other enjoyed the blissful yet menacing store-bought cookie dough, the experience inspired me to create this recipe, which doesn’t contain a single trace of raw egg. 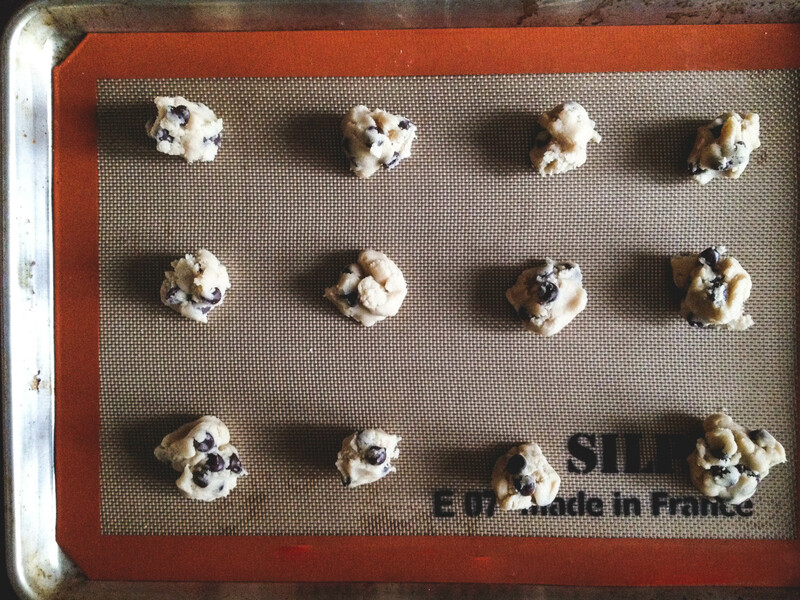 Is egg-less cookie dough exactly the same as the full-fledged stuff? Well, no, not exactly. For one thing, there isn’t that element of risk, that feeling of “I COULD BE DEATHLY ILL IN 24 TO 48 HOURS BUT IT’S JUST SO GOOD NOM NOM NOM.” So, there’s that. Also, this cookie dough is a little bit drier than the normal stuff, but that can be remedied quite easily with just a few tablespoons of water or milk. However, this recipe shouldn’t need that much doctoring – it’s pretty good as is, if I do say so myself! 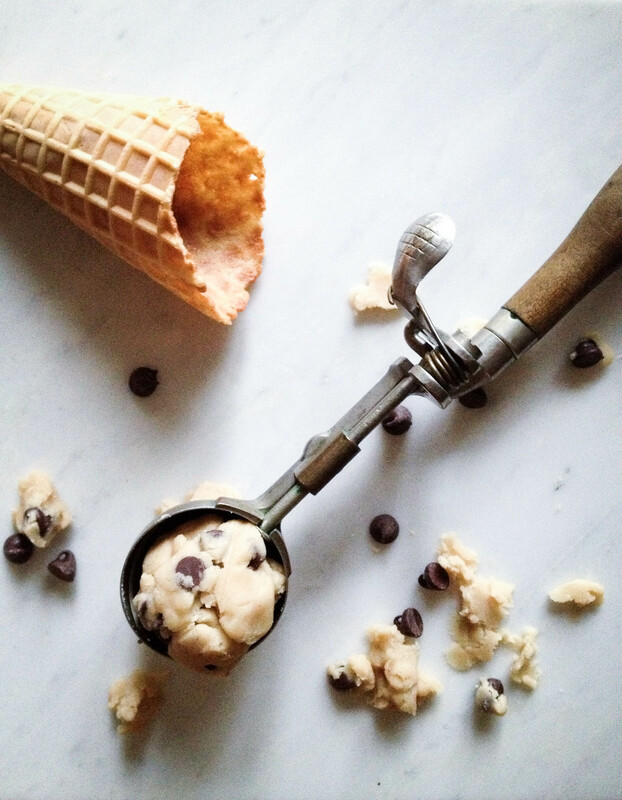 If you’re like me and you love snacking on cookie dough but your mom’s voice in the back of your head will forever diminish your enjoyment, never fear – take this recipe for a whirl and indulge. And, for those of you who laugh in the face of food-borne illness, I commend your audacity. 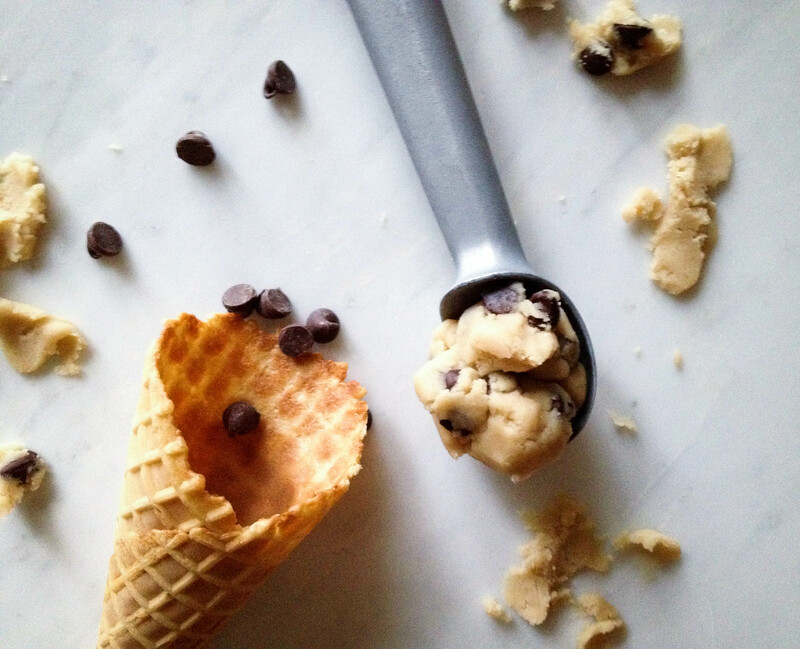 However, you should still try out the recipe – because this is some mighty good cookie dough, and it’s even better when swirled into some homemade vanilla ice cream. Yield: This makes a sizable log of cookie dough (enough for 2 quarts of ice cream plus extra for snacking). Cream the butter and the sugars until light and fluffy. Add the vanilla and mix until incorporated. 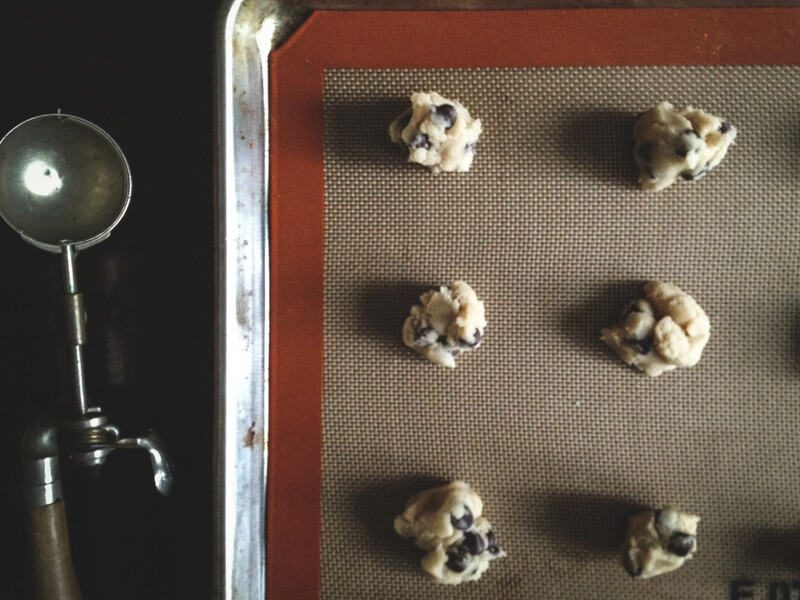 Dissolve the baking soda in the hot water and add to the cookie dough. Add the flour and salt gradually, tasting as you go. You want to be careful here, because adding too much flour will dry out the dough too much. Add the chocolate chips, and even some nuts if you wish. Wrap into a log-form using plastic wrap, and refrigerate until hardened, about 1 hour. I always enjoy reading your text — great writing! 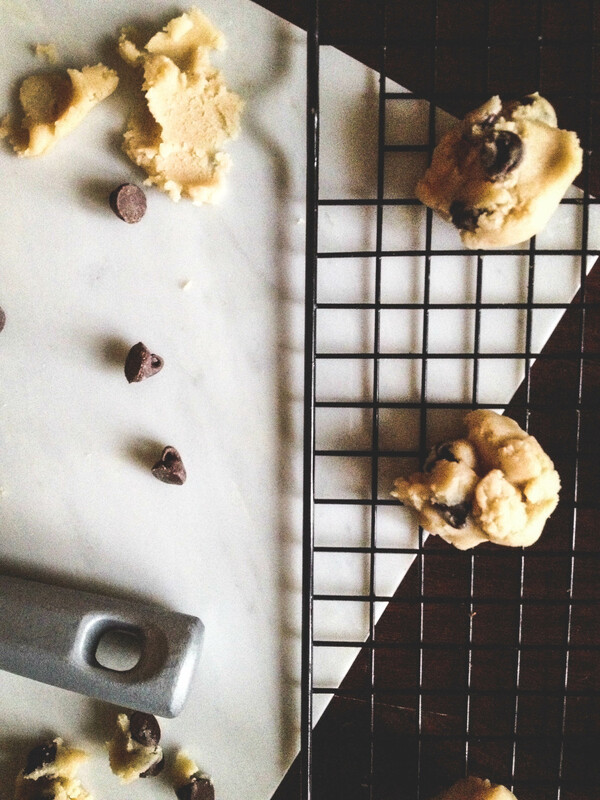 At times Market Day has carried eggless cookie dough — safe to eat — I am not Maureen or Kate. Hooray! Let’s not celebrate just yet though…you could still succumb to the evil powers of bacterial contamination!